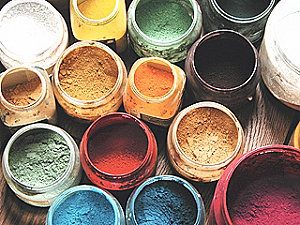 My dyes are made from ground spices, fruits, trees, roots, flowers and leaves, which I mix to obtain the required colour. These ingredients are proper treatments which colour hair. With plant dye, you will no longer need to be concerned about damaging your hair. Plant dye does not bleach dark hair, but gives it a wonderful shine, covers grey hair well which results in a very natural and glossy shade of colours which capture and reflect the outside light! The blend of certain plants in the plant-based dye also cleans the hair and scalp. Each result is unique! But there are rules to follow: plant dye sticks to healthy hair: dull and poorly looked after hair will not hold onto the colour. It is therefore vital to prepare the terrain by looking after your hair, nourishing it and removing toxins. Hair care products and shampoos are made from 100% natural ingredients. The alchemy of nature serving cosmetics. 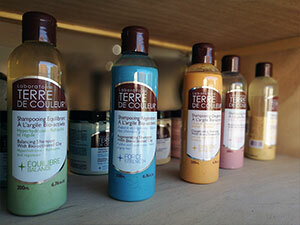 The Terre de Couleur laboratory uses this knowledge and creates real treatments for hair and skin which are easy to use and effective from the first application. The treatments address problems such as hair loss, dull and brittle hair, inflammation of the scalp, irritations and dandruff. In addition, they add substantial volume and shine.